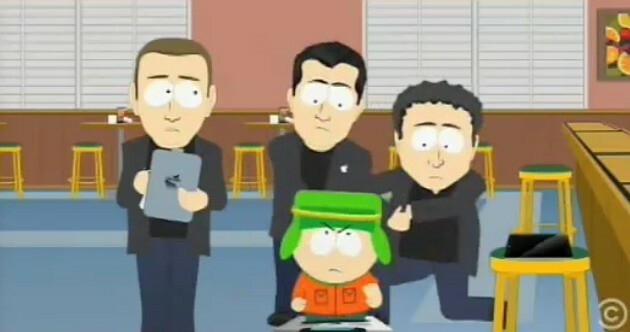 Apple is again all over South Park. Season 15 of the animated television series premiered yesterday and it aired with a bunch of humorous takes on Apple’s latest PR fiasco surrounding the iPhone location tracking issue. Plus, they also ridicule the iPad as the latest fashion must-have item. Check it out in Gawker’s reel or go to the official site and watch the entire episode entitled “HUMANCENTiPAD”, it’s worth your time (sorry, they don’t allow video embedding). Plus, the episode also pokes fun of lavish Steve Jobs media presentations.